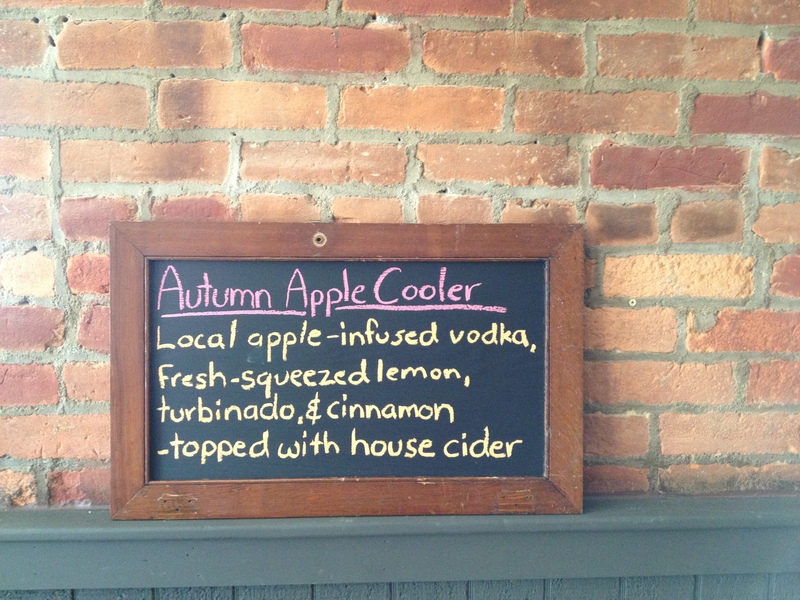 West End Cider House, Athens Ohio: This Cider House Rules! In other posts I’ve mentioned my approach to appreciating Athens which usually goes something like this: visit O’Betty’s, Casa Nueva, and Jackie O’s, then depending on time allowed repeat the previous and/or add in one or more of the following: Avalanche Pizza, Miller’s Chicken, Burrito Buggy, (new) Bagel Street Deli and then head home or repeat. 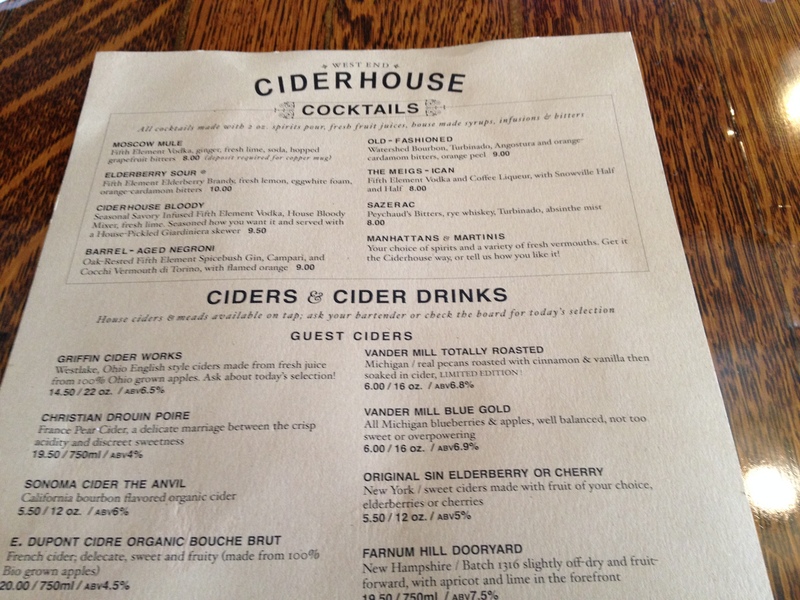 I’ve added a new mandatory stop to the list, West End Cider House. I’ve known Kelly Sauber for a couple of years. I met him in passing at Marietta Brewing Company many years ago and came to know him well when we started to put together the Athens Tour for Columbus Brew Adventures. Kelly is a whiz with all things brewed, fermented and distilled. He was a brewer for Marietta Brewing Company for about 15 years. He grew tired of the commute (about 1 hour) and decided to try his hand at distilling. Originally his distillery was known as Dancing Tree but there is another business with a slightly similar name so Kelly had to change the name to Fifth Element Spirits. Regardless of the name, Kelly crafts some divine distilled delights from vodka and whiskey to an extra tasty rum made with sorghum. I’ve never sampled anything I did not enjoy. Kelly is a wealth of knowledge so it is difficult not to spend at least several hours at his distillery (about 15 minutes southeast of Athens) when dropping in. Apparently Kelly found himself with a few hours of free time and was looking for another challenge so he partnered with his significant other to open West End Cider House in May 2014. 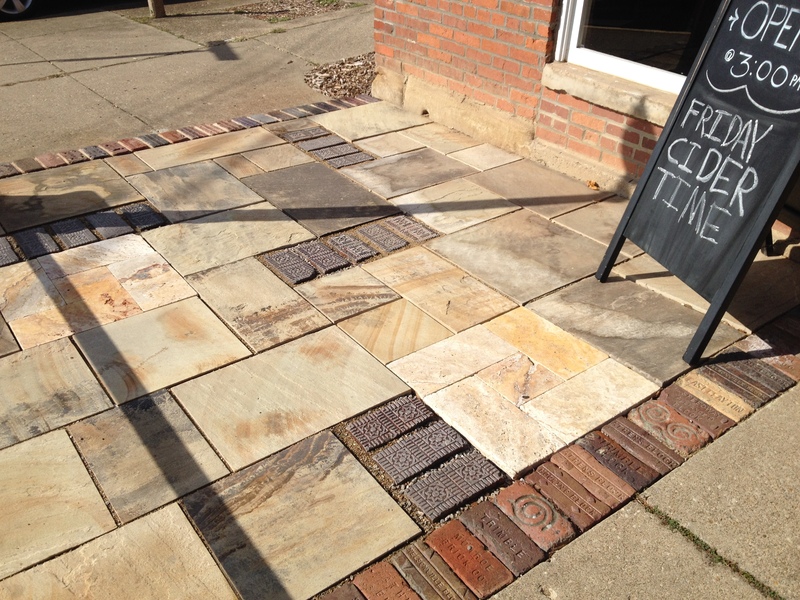 The West End Cider House is the sum of all of my obsessions: Athens + Craft Beverages + Block Pavers! I’ll just briefly mention the excellent integration of historic block pavers into the design and decor of the Cider House here and go into excessive detail on one of my other blogs -> Bricks of Ohio. Before we discuss the crafts of the business I’ll cover the details of the aesthetics of the building. The building itself dates back to 1880’s. It was once a confectionary or bar of some sort and it showcases some beautiful, original woodwork and cabinets from that era. The Athens area also serves as home to several great wood workers and they have had an opportunity to showcase their craft with some updates bar tops and other accoutrements. The block pavers I mentioned before are showcased on the back patio and the front of the building and include versions from about 20 or more Ohio brick / block making companies from the turn of the 20th Century. They not only look great but they highlight and preserve the history of the region. The space as a whole is just wonderful. 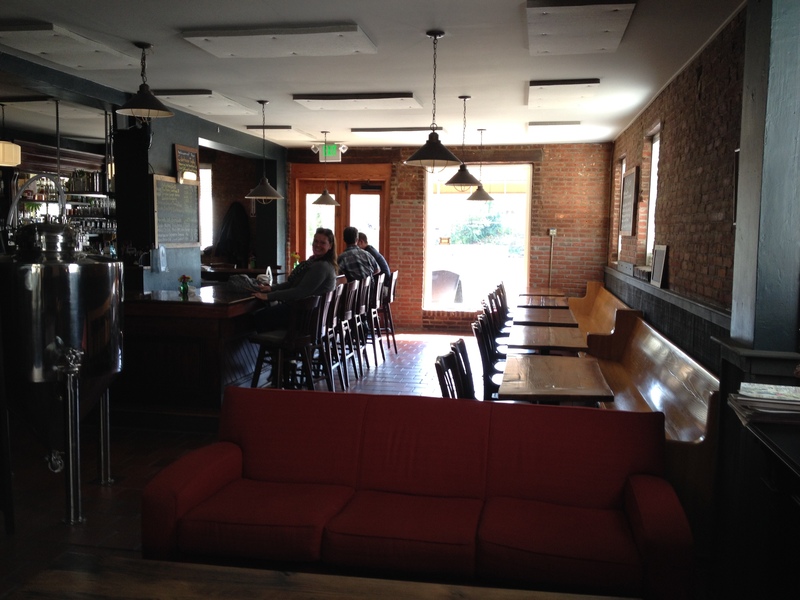 It is easy to plant yourself at a seat at the bar and spend all day enjoying the space and what they have to serve. The cider is made in-house with the tanks featured in the middle of the space. Kelly typically has 4-5 of his (constantly rotating) ciders on tap with 3 to 4 guest ciders featured as well. 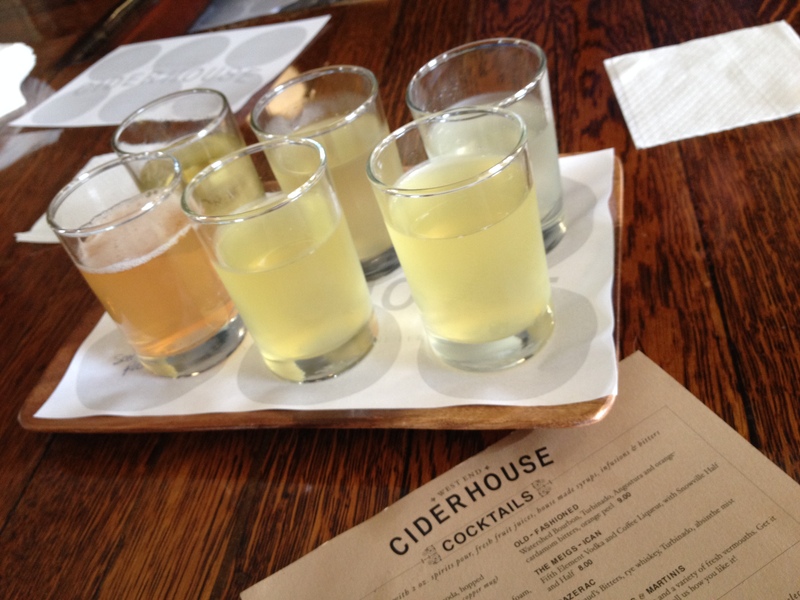 The bar features cider samplers with detailed descriptions of each. The beverage choices also include a few craft beers (notably a selection of harder to find beers from Portsmouth Brewing Company) and plenty of local/ regional craft spirits, wines and locally inspired cocktails (like the Meigs i can). 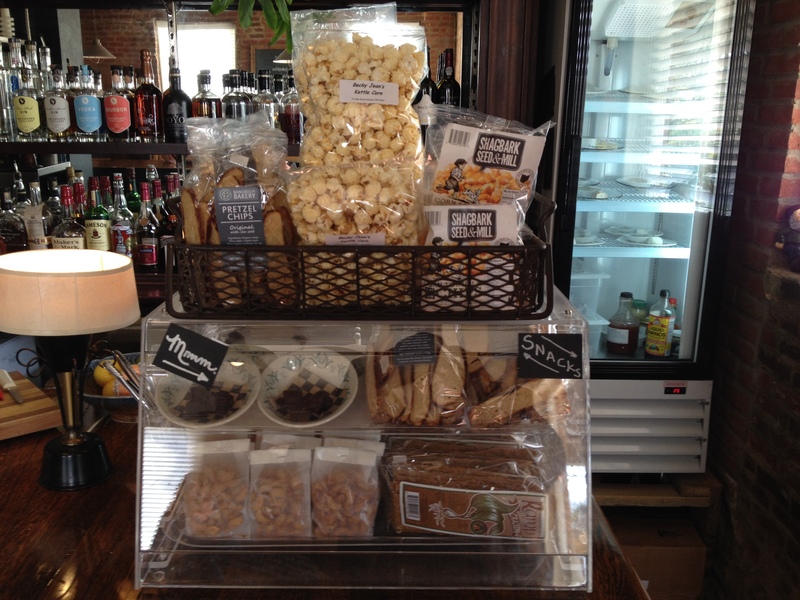 While there is no kitchen, there are several locally made bar snacks available and they often pair with local mobile vendors to have food near by. And, it is only a two-minute walk to Millers Chicken. 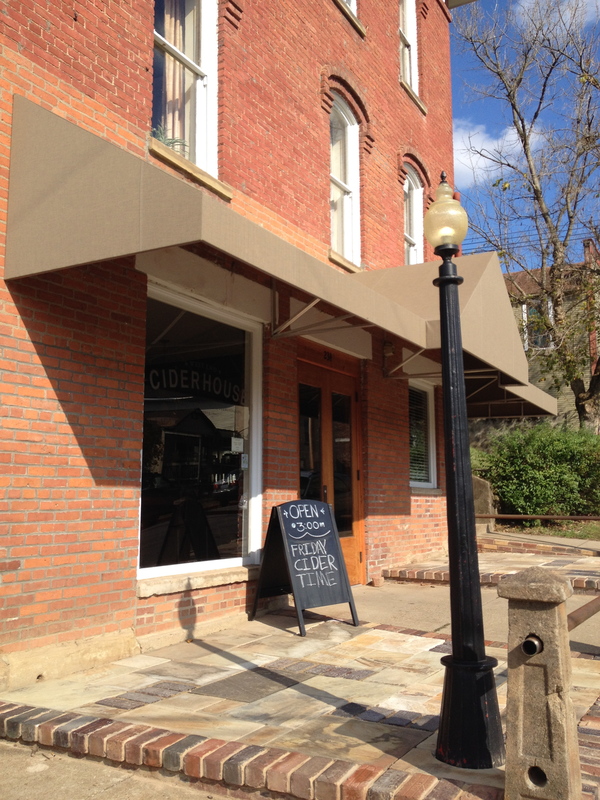 So yes, this Cider House is the perfect Athens area hangout, you won’t have to steer around students cramming in cheap beer but you are still close enough to the other local hotspots that you can walk (if you need to) to pace out your evening (or day) while in town. 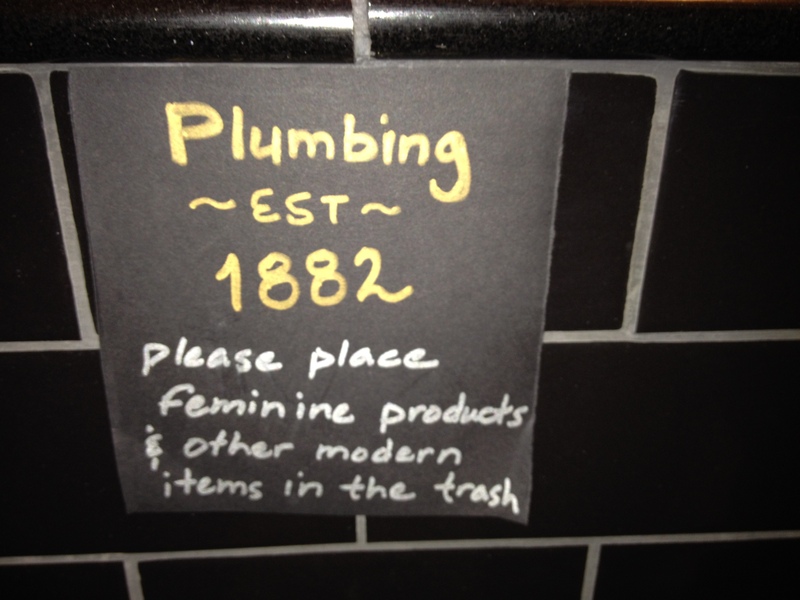 Oh, the the bathrooms are cozy and pretty cool to boot (note the sign below).